I'm often surprised at how some of my friends in the IT business who are Linux users have never tried Simply Mepis. This is a shame, because Mepis is not only a useful admin tool for anyone who works with computers (whether they be Windows or Linux machines), but it is an excellent Linux distribution in its own right. In short, SimplyMEPIS is one of an increasing number of pre-compiled, "Live" Linux distributions that can fit on a single, bootable CD-R. When started from the bootable CD, SimplyMEPIS runs from a ramdrive in the system memory. I regularly use Mepis (and a similar distribution known as Knoppix) to harvest and backup data from un-bootable Windows systems prior to starting system recovery efforts. 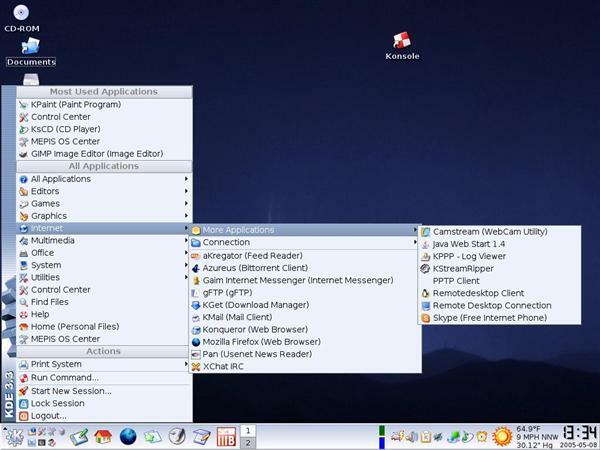 But SimplyMEPIS can also be easily installed to a computer's hard drive, resulting in a fast, sleek, polished Debian Linux system with a generous and well-chosen selection of applications. Although I have known this for quite a while, it was only a few weeks ago that I decided to actually try installing SimplyMEPIS to a hard drive. I was impressed enough that I decided to share it with our site visitors. Because SimplyMEPIS is a little unusual in that it is a Live Linux with an option for a hard drive install, I'll take a little extra time here to run through the basics of obtaining and installing Mepis. SimplyMEPIS is designed to be burned to a 700 MB CD-R. You can download the .iso image for free from a number of mirrors, or you can purchase a CD or a very inexpensive download subscription from the folks at Mepis. Once you download the image (it's about 700 MB, so don't even think about trying to download it on dialup), you have to burn the .iso image to a CD. Most popular CD-burning software can do this; if you don't know how, then please read this for more information. One of the nice things about Live Linux distros is that you can try them out first to see whether they like your hardware. To boot from the SimplyMEPIS cd, simply insert it in the CD-ROM drawer, make sure your PC is set to boot from CD, and boot it up. Once you get to the KDE interface, log in as "demo" (the password is also "demo", without the quotes), and try it out. See if everything works and if you like it (understanding, of course, that it will be slow because it's running from a CD and RAM). Like Linux in general, SimplyMEPIS doesn't require bleeding-edge hardware. A 32-bit Pentium or Athlon-class processor and 128 MB of RAM are the minimum recommended. 64-bit processors were not yet supported at the time of this writing (although the 32-bit Mepis will install and run in 32-bit mode on 64-bit machines). You will need a minimum of 2.5 GB of hard drive space (at least 4 GB is preferred) for a hard drive install. The root partition must be on an IDE or SATA hard drive.